How do I upgrade my Magicard Rio Pro to a dual-sided printer? Replace Cards with clean ones and do not touch the print surface. Select Menu option [1. Clean rollers], press [Ok] and follow the on-screen instructions. [Remove the cards!] � lift out the (rear) feed hopper and then press [Next]. [Remove film] � open the lid and lift out the dye film. Leave the lid open and press [Next]. [Ready to clean?] - Take a new cleaning card from its packaging and then press [Yes]. [Insert cleaning card into slot] � when prompted, place the narrow end of the cleaning card into the front card feeder slot. 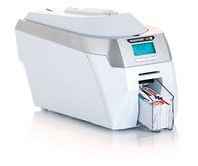 The card will automatically enter the printer and the rollers will be cleaned. When the cleaning cycle is finished, the cleaning card will be ejected. [Clean again?] � for maximum cleaning effect it is recommended that you turn the cleaning card over and select [yes]. Open the printer and remove the used dye film. Pull out the used cleaning roller. (This is the blue roller positioned behind and below the rear dye-film spool). Remove the metal bar from the center of this cleaning roller. Peel off the protective layer carefully. Place the new cleaning roller into printer. All you need is a dual-sided upgrade kit. Purchase a special YMCKOK ribbon that will unlock the dual-sided capability of your Magicard Rio Pro. Open the lid and remove any dye film that may be installed in the printer. Load the special dye film supplied with your upgrade kit. The display now shows �Duo�. You can now print dual-sided cards.